5 Then you will look and be radiant, your heart will throb and swell with joy; the wealth on the seas will be brought to you, to you the riches of the nations will come. 6 Herds of camels will cover your land, young camels of Midian and Ephah. And all from Sheba will come, bearing gold and incense and proclaiming the praise of the LORD. 10 The kings of Tarshish and of distant shores will bring tribute to him; the kings of Sheba and Seba will present him gifts. 11 All kings will bow down to him and all nations will serve him. 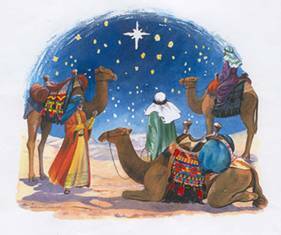 In Christian tradition the Magi, also known as the Three Wise Men, The Three Kings, or Kings from the east, are Zoroastrian judicial astrologers or magi from Ancient Persia who according to the Gospel of Matthew came “from the east to Jerusalem”, to worship the Infant Jesus, whom they describe as the Christ “born King of the Jews”. According to Matthew, they followed a star, know to become the Star of David, and as they approached Jerusalem, Herod tried to trick them into revealing where Jesus was so he could be put to death. Upon finding Jesus, the magi gave him an unspecified number of gifts, amongst which are three highly symbolic ones. The Magi were then warned in dreams that revealed Herod’s true deadly intentions for the child and decided to return home by a different route in order to thwart them. This prompted Herod to resort to killing all the young children in Bethlehem in an act called the Massacre of the Innocents to attempt to eliminate a rival heir to his throne, although Jesus’ family had escaped to Egypt beforehand. The story of the nativity in Matthew glorifies Jesus, likens Him to Moses, and shows His life as fulfilling prophecy. The story of the magi is not without its controversies. Why should we care about Biblical prophecies? Why are stories like the magi so important to our Christian faith? What Bible stories about Christmas are your favorites? When relating stories such as the magi and Jesus to our children, what are some of the benefits they might derive? The Christmas story has been so steeped in tradition, that we may have been misled by some of that dogma, so it is reasonable to spend a few moments and look at the scriptural and historical context of the event. In Matt. 2:1-2, Matthew introduces us to King Herod and the Magi. King Herod, known as Herod the Great, died in 4 BC, placing Jesus’ birth as much as two years before that, around 6 BC. Furthermore, since the description of the birth describes shepherds in the fields watching over their flocks, the time was most likely Spring or Summer, not winter as tradition has held. The early church celebrated Easter, not Christmas, as there was no indication of the date of Jesus’ birth. The churches of Asia Minor started celebrating Christmas, choosing January 6th as the day to do so. The Roman churches replaced the pagan celebration of Saturnalia that was celebrated on December 25th. Eastern Orthodox churches still celebrate Christmas on the 6th of January. King Herod ruled over Israel for over thirty years. He was appointed to the position by the Roman government, succeeding a series of kings from the Hasmonean dynasty by marrying his cousin, Miriamne, of the Hasmonean family. As a half-Jew, hated by the Jews for his Roman allegiance, hated by the Hasmoneans for taking the throne, his reign was marked with violence that was brought on by his insecurity. He dealt with any threat to his reign with ruthless violence. During his reign he killed his wife and two sons, and even at his death he ordered the killing of another son who he had planned to succeed him to the throne. He was succeeded by his son, Antipas who reigned during Jesus’ ministry. His grandson, Agrippa I is mentioned in Acts 12, and his great-grandson, Agrippa II, is mentioned in Acts 26. Finally, the Magi, the wise men from the East are introduced. Most likely, these were followers of the Zoroastrian religion, a sect that looked for guidance from the stars, and came from the area of Persia, since the word for “wise men” is of Persian origin. Much of our perception of the visit of the wise men comes from the Christmas carol, “We Three Kings” rather from scripture, a carol that bears little scriptural resemblance. We have no idea of how many visitors there were. The assumption that there were three is based upon the three gifts that were given. The traditional assignment of names, Gaspar, Melchoir, and Balthasar is pure fantasy. The word rendered “wise men” is used only two other places in the New Testament, in Acts 8:9 to describe the magician who Peter confronted, and in Acts 13:5 to describe the magician who Paul confronted. In both of these other cases, as with the modern interpretation of the word, magician, there is an anti-Christian connotation to it. Following the reign of Cyrus, King of Persia, who allowed the Jews to return to Jerusalem and rebuild the temple under Nehemiah, the relationship between the Jews and Persians was peaceful, so the Magi from Persia would be treated with respect. Why would King Herod be disturbed by this news? Recall that he would perceive the coming of a king as a threat to his dynasty. In the past he dealt with all threats by killing those who would challenge his authority, and this would be no exception. He saw the birth as a threat. Why would Jerusalem be disturbed? There could be two reasons. First, any time the King was disturbed, there would be violent consequences, and any such worries would be well-warranted, as we shall see later in this chapter. Also, the Israelites had been waiting for the coming Messiah who would free them from foreign oppression. The birth of such a King would be the beginning of their freedom. They would see the reign of evil King Herod as one of the first to be destroyed by the new King. There was a lot of reason for unrest. It is obvious that King Herod approached this subject with great gravity and importance. He called together all of the chief priests and teachers of the law. What was the purpose of this gathering? Apparently, Herod’s half-Jewish background lacked the teaching of the prophesies. He was a Jew by hypocrisy, led by his insecurities to act like a Jew so that he would be more accepted by the people. The location of the birth of the Messiah was prophesied by Micah (5:2) to be in Bethlehem. This is no surprise since Bethlehem was the city of David, the city where King David was born. Herod’s hypocrisy is again revealed by his actions. Why did Herod call the Magi secretly? He did not want the Jews to know that he was looking for the Christ child. If this were public knowledge, what would happen? Certainly it would incite a revolt, as the Jews would know that Herod’s purpose would be to kill this threat to his throne. Such a revolt would be more dangerous to his throne than any individual would cause since Rome placed him there to keep the peace and maintain allegiance to Rome. His inability to maintain peace would result in his immediate replacement, and he would pay violently for the ruthlessness of his reign if it were ended. Obviously, Herod had no intention on worshipping the Christ Child. After leaving the King, the star appeared again. They were overjoyed at its appearance. Certainly it was the first star of its kind they had ever experienced, and it was leading them personally to this child King that they were even now learning more about. The trip from King Herod to Bethlehem was about five miles, so it was probably about an hour-long journey. The star led them directly to the house where Jesus was. Some commentators argue that there is no significance to the three gifts other than their great value, and valuable they were. However, we might gain some inference to the wisdom of the “wise” men if we look at the application of these gifts. Gold was the most precious of metals, and was useful for all manner of commerce. Herod’s brutal attempt to kill the Christ would cause Joseph to flee to Egypt until after the King’s death. Certainly the gold would be useful to sustain them during this period. Frankincense is a valuable and rare incense that is burned to create a perfumed smoke that was given as an offering to God. Incense was often burned in the Tabernacle as an act of worship. The third gift, myrrh, is most unusual as a gift to a child. Myrrh is a valuable perfume, or ointment, that is used to embalm the dead. Gold is a gift for a man. Frankincense is a gift to God, and myrrh is a gift for one who is to die. Through these three gifts we see the three primary depictions of who the Christ was to be: a depiction of the Messiah that is true to prophesy, and contrary to the then popular belief that the Messiah would free Israel from Roman oppression. The gifts describe a man-King, as the people were expecting. However, they also describe a God, referring to Jesus’ deity as illustrated by his immaculate conception and later by His united relationship with God the Father, and again proved by his resurrection and ascension. They also prophesy his death on the cross as an atonement for the sins of all mankind, making a way for all mankind to be saved. The three gifts were valuable, and appropriate. These gifts were also brought by men who were unfamiliar with scripture, and were not aware of the dynamic Christian history that would unfold over the next hundred years. The wise men did not return to Herod as he had asked them to do. They probably knew quite well of the king’s hypocrisy since their wisdom is evident in their actions. However, they were obligated to return to the king because of his authority. This question would have arisen after they had left the Christ child, if not even before they arrived in Bethlehem. God warned them in a vision not to return to Herod, so they returned to their homeland without going back to Jerusalem. They did this at their own peril, knowing that if Herod knew about their flight he would certainly hunt them down. Matthew records Herod’s actions following the flight of the wise men. An angel comes to Joseph in a dream and tells him to leave immediately for Egypt to avoid Herod’s coming persecution. Herod, upon learning that he had been out-witted by the wise men, ordered the immediate killing of all male Hebrew children within the region of Bethlehem who were less than three years old. His orders were carried out, fulfilling the grievous and dooming prophesy of Jeremiah 31:15. Joseph would return after the death of Herod, but not to the still dangerous area of Bethlehem (Herod Agrippa was now in power), but to the new and less familiar area of Nazareth. This fulfilled yet another prophetic paradox, that had the Messiah coming from three different places: Bethlehem, Egypt, and Nazareth. What can we learn from the magi about how to approach Christ? What are the modern day parallels or metaphors that would align our giving of gifts today to the gifts of the magi? How should we tell this story to our children? What relevance to you assign to the fact that the magi were magicians? How do we keep the world from prostituting the Bible’s significant of gift giving?